One of my biggest complaints about living in Santa Monica was the lack of good restaurants. Now Santa Monica has its own answer to Joan’s on Third: Huckleberry Bakery and Cafe. Well, Huckleberry is better than Joan’s on Third. First of all they’re committed to using local farmers’ market ingredients, free range, hormone and antibiotic free meat, poultry and dairy. I also don’t like most of Joan’s on Third’s pastries and few of their sandwiches do it for me. Huckleberry’s food has more of a rustic feel, like if you were over at your best friend’s house who also happened to be a baker and chef and she whipped up a sandwich with farmers’ market fresh ingredients, Niman Ranch bacon, and freshly baked bread. Yep, Huckleberry’s bread is made in-house. Did I mention that their croissants are to-die for? 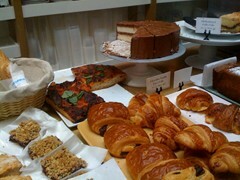 Try the Valhorona chocolate croissant or their La Quierica prosciutto savory ones. Take a seat at a reclaimed wood table and devour their green eggs and ham. The “green” is pesto, duh. I already wish their breakfast was served later than 11 am weekdays. (Come on guys, at least have it until noon). It is served until closing on the weekend. Their coffee is from Caffé Luxxe, one of my favorite Westside coffee joints. Oh, they also have homemade cinnamon and sugar, and glazed donuts. It’s really good that I don’t live near Huckleberry because I would gain a lot of weight. I fell in love with pastry chef Zoe Nathan’s pastries @ Rustic Canyon’s now defunct Saturday café style breakfasts and it’s been torture going months without her luscious pastries since I haven’t been able to make it to Rustic Canyon for dinner. Nathan was just named as a semifinalist for the prestigious James Beard awards. S. Irene Virbila from the Los Angeles Times also mentioned her on her shortlist of 2008’s Most Memorable Meals. 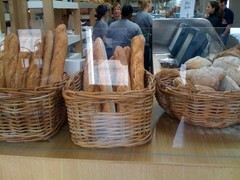 The bakery and café also has rotisserie items, soups and salads. (I want to try their warm turkey meatball sandwich next). Check their website for their full menu and daily specials. Be warned: you will drool. Huckberry is in its soft opening stage with current hours 8 am – 4 pm., Wed – Sunday. Their hours and days will soon expand. The "green eggs" sound so yummy. Pesto & eggs...I have to try that. Your wonderful food descriptions have my mouth watering! OT: Will you be present @ the Oscars or any of the after parties tonight? If yes...I can't wait for your detailed accounts. On the one hand you desire fresh wholesome food, on the other hand you eat croissants and bacon? Thanks for the heads up on this place. I used to live near there and Tartine is my favorite bakery in SF. I'll be sure to try it out.